In this exhibit we continue our foray into the world of high-concept sitcoms, specifically of the alien-in-the-livingroom subgenre. 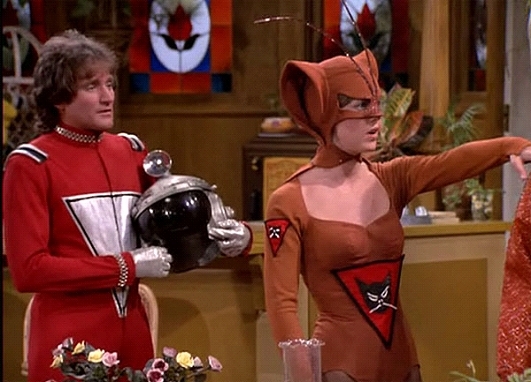 Where My Favorite Martian portrayed the visitor as a font of wisdom and experience, Mork and Mindy substituted zany naivete in the form of white-hot superstar Robin Williams. Can a show succeed for four seasons on the back of a comedic genius in rainbow suspenders? Listen in to learn about the show's unlikely genesis in the brain of grade schooler, discover who popped out of an egg in the final season, and find out what David Letterman was up to pre-Late Show. Gizmodo calls M&M an "Unlikely Miracle"
Don't spend the summer squinting! Check out super affordable and fashionable prescription sunglasses from Warby Parker and support The TV Museum. Go to warbyparkertrial.com/tvmuseum .